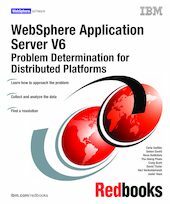 This IBM IBM Redbooks publication is intended to help customers through the process of identifying and resolving problems in WebSphere Application Server V6 on distributed platforms. Previously published as a series of IBM Redpapers, each chapter addresses a specific aspect of the problem determination process. Links to the original papers are provided throughout the book. The first paper, Approach to Problem Determination, should be the first stop for IBM WebSphere Application Server system managers. It provides information that is useful in preparing for and preventing problems. It then details what actions to take when a problem occurs and helps you define the problem. Once the primary symptoms are identified, it helps you narrow down the problem to terms that are similar to those used by the IBM support team, and leads you to more specific information that can help you pinpoint the problem. The subsequent papers address selected topics that have been identified as some of the more common problem types that customers usually need to address.